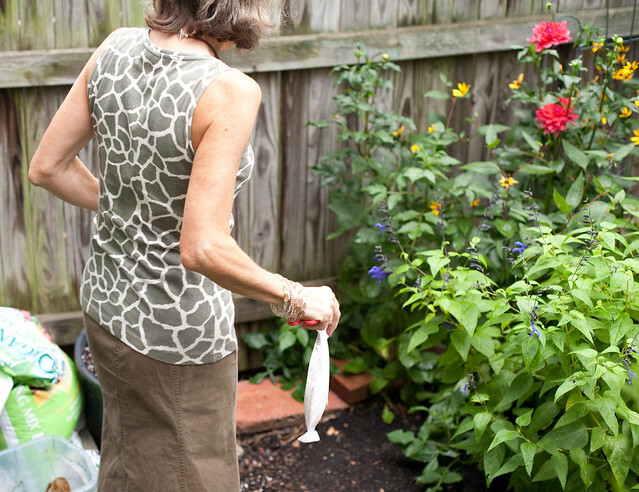 Eileen has a beautiful flower garden in the courtyard behind her row house. As soon as you walk out, you’re enveloped in a leafy oasis. 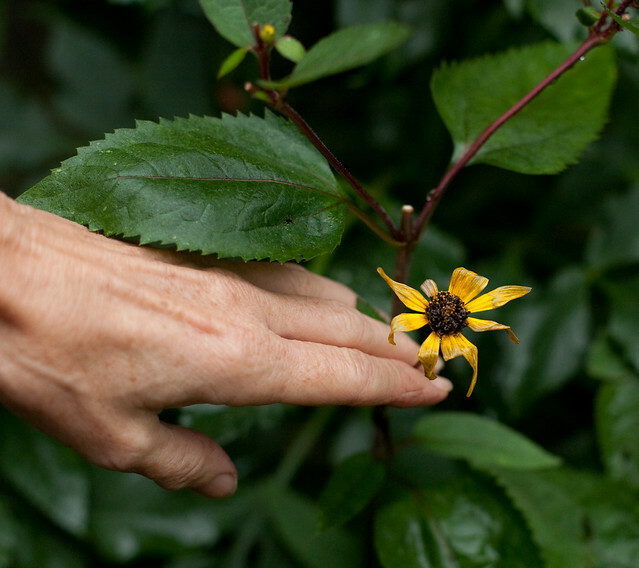 A landscape designer, she takes the utmost care of her plantings, so she noticed a problem with her Heliopsis flower petals right away. And the culprit became readily apparent as well: aphids. You can see the red critters encircling the stem just below the flower. I wouldn’t have known what they were, but an experienced gardener sure would. 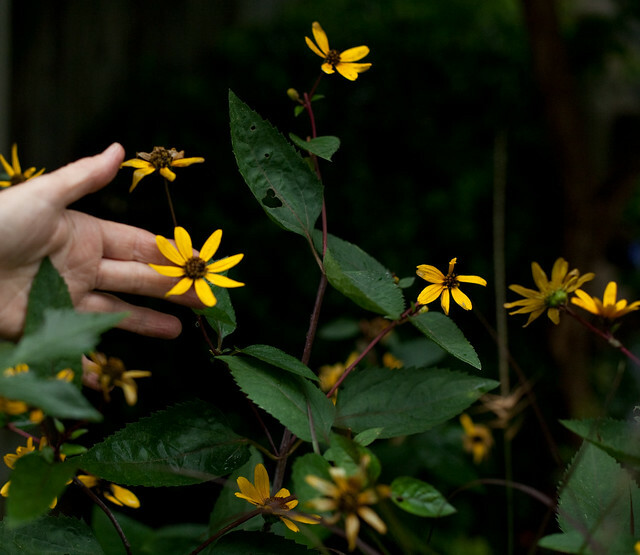 The Heliopsis should look like this – full, rich in color, with leaves intact. 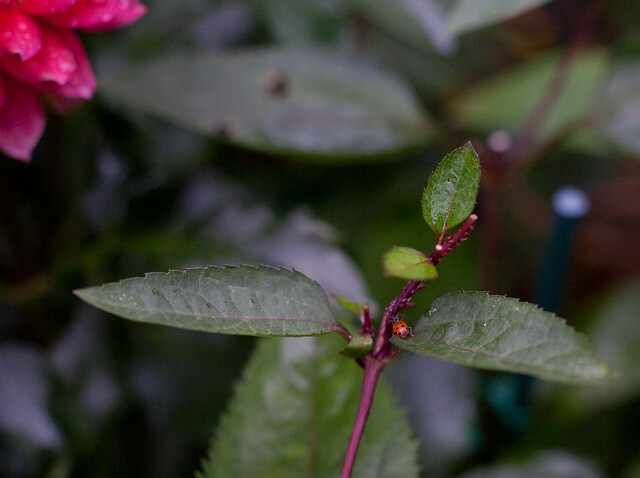 But the aphids, little by little, have been decimating the flowers. 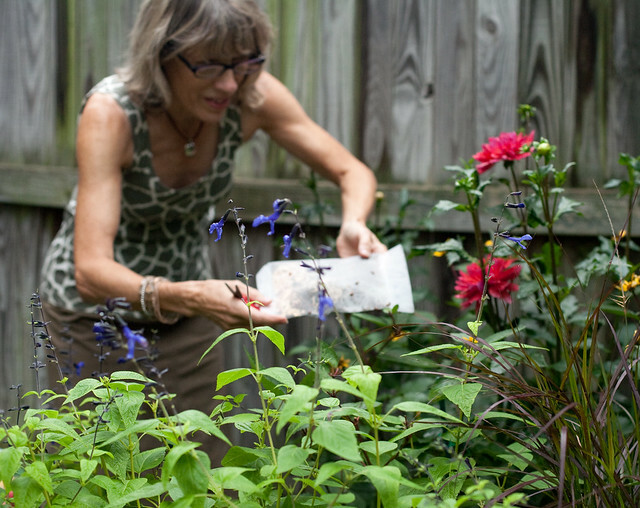 Instead of using pesticides, Eileen chose to call in a natural predator of aphids: Ladybugs. And not just a few. 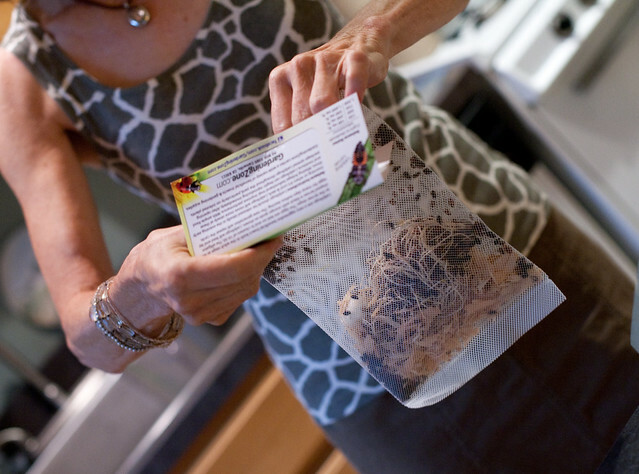 Eileen wasn’t fooling around – she ordered by mail a packet of 1,500 live ladybugs. She was told to release about 50-75 at a time, in the late day and early morning hours. I went outside with her the other night to watch her let the first batch of hungry ladybugs free. Many of them went straight for the aphids. Others took a little while to get reoriented after their long journey through the mail. 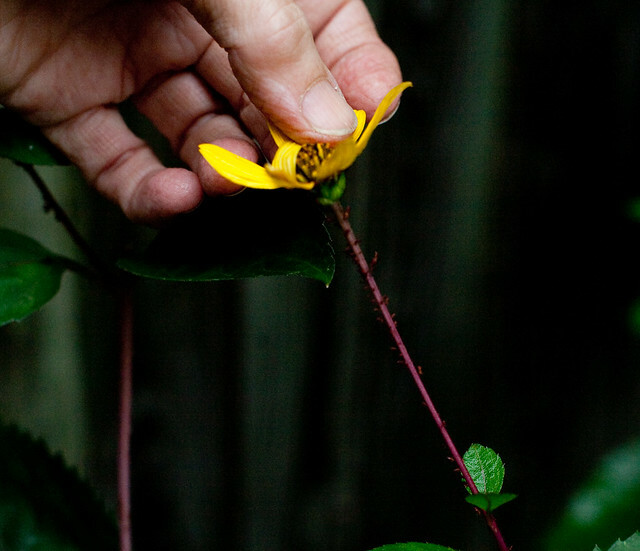 But, they all clung to the leaves and stems eventually, crawling to and fro. Many of the ladybugs, she said, had moved to the healthy, aphid-free dahlias. After she released all of the 1,500 ladybugs, they still didn’t seem too interested in the aphids. “Throughout the morning yesterday,” she says, “I saw one after the other fly off in search of….what? Clearly not aphids! This morning there are a few ladybugs still on the plants, but just as many aphids as before.” She concludes that it was an interesting experiment that didn’t work. 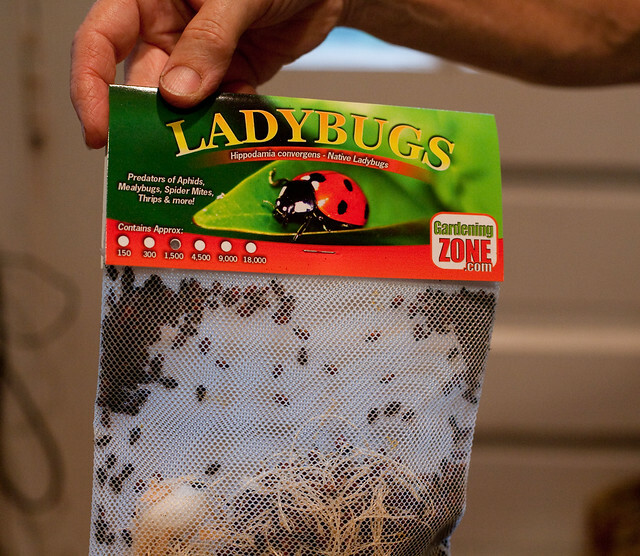 Have you used ladybugs to deal with an aphid infestation on your plants and has it worked for you? I’ve read experts say that ordering ladybugs often doesn’t work, partly because they can decide to go next door. (Though we love ladybugs wherever they are!) I get aphids on some of my milkweed. I have so much of it that I just cut the part off with the aphids and throw it in the non-recycled trash that will be burned up. Close the bag up so the little devils are stuck inside! I’ve also sprayed them with an organic oil when I’ve found them on petunias. 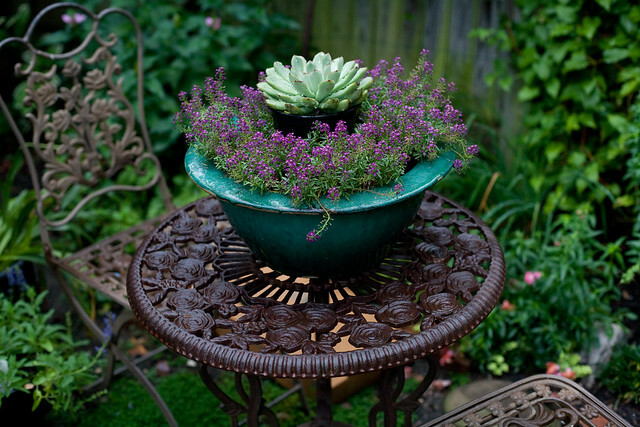 It does a pretty good job, but I try to catch them before they get a good foothold and often remove part of the plant where they are. A lot of the ladybugs sold are not our native ladybug but another variety that does not lust after aphids but is easier to reproduce. Suggest you check a guide to native insects to get the exact name of our native species and look for a business that guarantees that its ladybugs are the native species. Thanks everyone, I appreciate your thoughts and input. I decided to try the ladybugs after knocking off every single one of the aphids with a jet of water two days running, then spraying them on the third day with insecticidal soap. But every morning I woke up to just as many aphids as the day before. 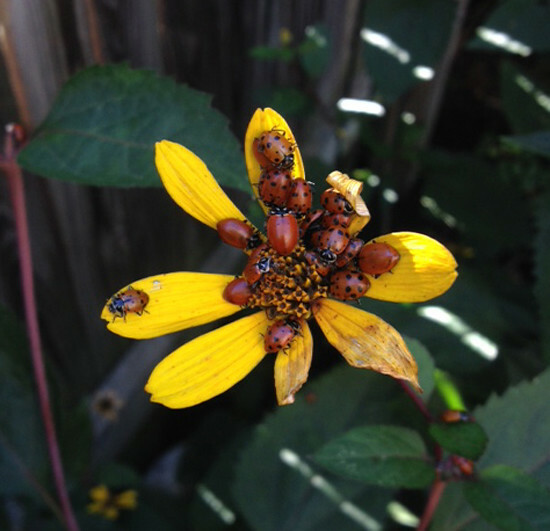 The ladybugs I ordered are a native species, but I wondered if perhaps the aphids are not…. ?